China Hotel Guest bartenders welcome the arrival of Mr. Kareem Spillman. 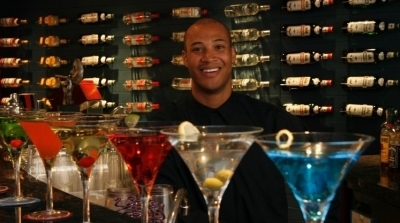 Mr. Kareem Spillman from the New York Marriott Marquis, with over ten years cocktail experience. Kareem on the trip to Guangzhou was very excited, he said: "I never tired of the modulation of drinks, in my view, the modulation of a good martini and cocktail drinks are bartenders lifelong pursuit. I'm looking forward to show you my finest creations. " Sapphire Lounge is open daily from 3pm to midnight, a total of more than 50 creative martini cocktails and other drinks are available and tasting, wine enthusiasts gather to drink in town is the best choice .